If you're running ASP.NET Core under Windows with IIS, you'll want to take advantage of letting IIS serve up your static content and handle your HTML 5 Client and home routes. IIS is very efficient at handling static content and content re-routing and in this post I describe how you can configure ASP.NET Core applications using the AspNetCoreModule and IIS Rewrite Rules. When running ASP.NET Core under IIS, a special module handles the interaction between IIS and the ASP.NET Kestrel Web Server. There are a number of ways how you can handle the interaction between IIS and Kestrel in regards to what server handles what specific types of requests. I talked about this in my More on Running ASP.NET Core on IIS post a few weeks back. Based on the discussions that followed, the most interesting part of that post revolved on how to set up IIS correctly to allow separation of the API content that the Web API application creates and the static content that the rest of the site requires. In this post I revisit that discussion that revolved around handing off static content to IIS, and in this post I add a few additional considerations regarding client side routing and root URL handling. When running ASP.NET Core applications in production, it's a recommended practice to run a front end Web Server to handle the ‘administrative’ part of a typical Web server. There's more to a Web Server than merely serving up content from a source, and full featured Web Servers provide a number of features that Kestrel does not provide natively and arguably shouldn't. Kestrel is ASP.NET Core's internal Web Server and when you run an ASP.NET Core application you usually run Kestrel as part of the .NET Core application. Unlike classic ASP.NET which integrated tightly with IIS, ASP.NET Core handles its own Web server processing through a default Web server implementation that is Kestrel. Kestrel is very high performance Web server that is optimized for raw throughput. It's considerably faster in raw throughput than running ASP.NET, but at the same time it's also a basic Web Server that doesn't have support for the full feature set of a full Web Server platform like IIS, Apache or even something more low level like nginx. Kestrel has no support for host headers so you can't run multiple Kestrel instances on the same port, content caching, automatic static file compression or advanced features like lifetime management of the server process. While it's certainly possible to run Kestrel on a single port directly, most commonly you typically end up running Kestrel behind a front end Web server that acts as a proxy. Incoming requests hit the front end server and it forwards the inbound requests from port 80 or 443 typically to Kestrel on its native port. The front end can handle static file serving, content caching, static file compression, SSL certs and managing multiple sites tied to a single IP on port 80. On Windows this typically means you'll be running Kestrel behind IIS as shown in the figure above. Although I show IIS here, the same principles discussed in this article can also be applied to other Web Servers that act as front ends, such as nginx, Apachy or HA Proxy on Linux. This article discusses the issues in terms of IIS, but the concepts can be applied to other Web Servers on other platforms with different configuration settings. When you run in IIS, there's an AspNetCoreModule that handles the interaction between IIS and Kestrel. In order to use the AspNetCoreModule on a Windows server, make sure you install the Windows Server Hosting Bundle from the runtime download site. Alternately you can also install the module as part of the full Dotnet SDK installation. ASP.NET Core applications don't run ‘in place’ but rather are published to a special publish folder that contains all the runtime, library and application dependencies as well as all the Web resources by way of a publishing process. When you publish an ASP.NET Application with dotnet publish, the process creates a web.config file that includes a hook up for the AspNetCoreModule. 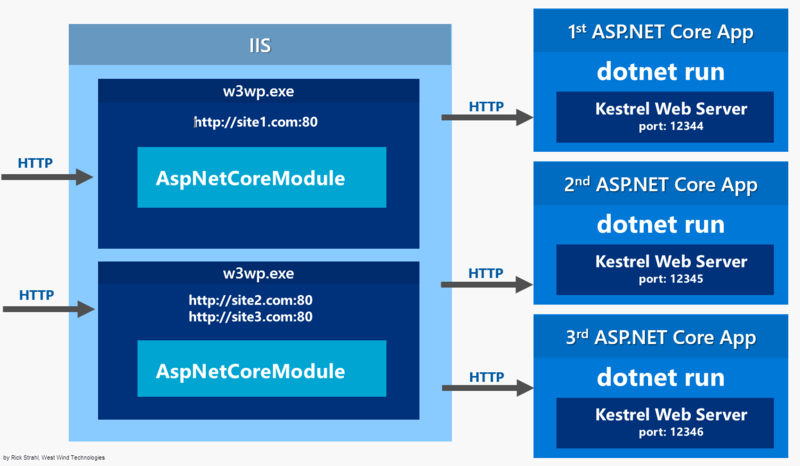 The AspNet Core module is a low level IIS module that hooks into the IIS pipeline and rewrites the current URL to the Kestrel server running on the specified port with which the appliction is configured - 5000 by default. By default, as requests are fired against IIS, every request in the Web site or Virtual is forwarded to Kestrel. In and of itself the AspNetCoreModule forwards each and every request to Kestrel. It works - your application will run, but this makes your backend application also handle every static file from the front end. Even if there was a better static file module for your ASP.NET Core app, I'd argue that static file serving is better left to a front end Web server rather than tying up Kestrel resources. The better course of action is to let IIS handle the static files and let Kestrel deal only with the API or server generated content requests that the application is designed to serve. To separate commands we can take advantage of UrlRewriting in IIS. We can essentially take over all non-API URLs and let IIS serve those directly. To do this is not as trivial as it might seem. 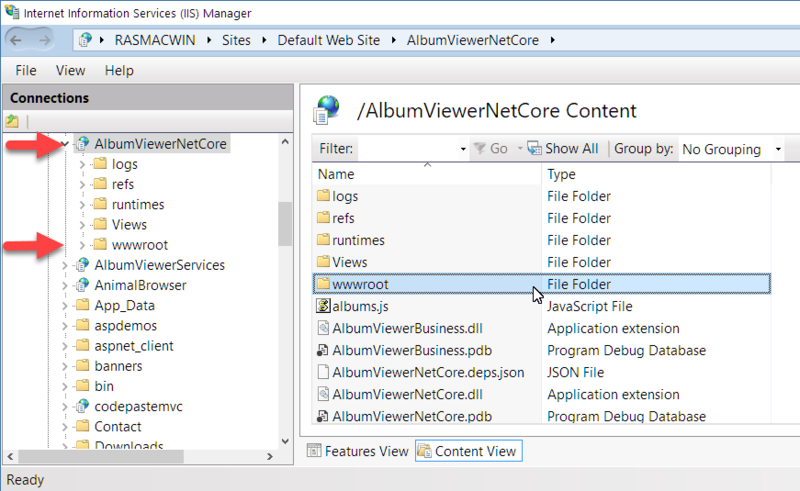 ASP.NET Core applications run out of a root publish folder which is designated as the IIS Web Root, but the actual Web content the application serves lives in the wwwroot folder. In other words, the module automatically retrieves content out of the wwwroot folder when serving static content via some internal rewrite logic. and expect that to take care of letting only your API requests be handled by Kestrel. While this works for API requests, this leaves all other requests to be served by IIS - out of the root folder as the base. The problem is the root folder contains all the application DLLs, configuration files etc. rather than the actual Web content, which lives in the wwwroot. This effectively opens the root folder with the DLLs and config files to the world. Not a good idea, that - don't do it! The work-around is to use UrlRewrite to create static file mappings in IIS to specific extensions and route those explicitly into the wwwroot folder with re-write rules. This configuration forwards all common static files into the wwwroot folder which bypasses the AspNetCoreModule. Rewrite rules fire before the AspNetCoreModule gets control so all the static files get processed by IIS. Note that I leave the AspNetCore module path at *to allow anything not captured by the static file module mappings to still fall through to Kestrel, so there won't be broken links for unhandled file types. One big win in this is that IIS is very fast and has very low overhead with static file processing. IIS utilizes the http.sys Kernel Cache for content caching and any files cached are served without ever hitting the IIS pipeline directly out of kernel code which is about as fast as you can get on Windows. Additionally IIS very thoroughly handles both client and server side cache settings, Gzip compression and more. For static file performance it's going to be hard to beat IIS on Windows. So let IIS do the job it's really good at and serve static files with IIS! Html 5 routing works with client side pushstate events that intercept URL navigation. This allows frameworks like Angular to intercept URL requests to perform client side route navigation that makes it possible to navigate back to a saved URL after the client application is no longer loaded in the browser. To work around this, the server needs to intercept incoming requests and distinguish between legit server requests - API routes and Static File requests for the most part - and these client side URLs. We could handle this inside of the ASP.NET Core application with some custom middleware routing logic, but that introduces overhead into the application that can and probably should be handled more easily with IIS and UrlRewriting. Using IIS UrlRewrite we can intercept non-file/directory and non-API routes and instead serve up the index.html page as content. By rewriting the URL the original URL stays intact, but the content returned is index.html. When the page loads the client side framework can detect the URL and navigate the client side application to the appropriate deep linked page. This serves the content of index.html if the request doesn't point at a physical file or directory, or at the API url. Here I assume the API requests start with an api prefix. If you use something else or use multiple apis with different prefixes adjust the match pattern (or multiples) accordingly. which in this case points at the root site. If your site runs out of a virtual then the base URL has to change. HTML 5 Client side routing can be confusing and as you can see there are a few configuration requirements. This is one of the reasons I often prefer old style hash bang client routes like #/albums/1. They don't look quite as clean since they are prefixed by the #, but they just work without any special workarounds on the server. Client frameworks like Angular let you choose between the default HTML 5 routing or hash bang routing. Another required rule is to handle the default / or blank route. The AspNetCoreModule apparently fires before the IIS Default Documents can be processed. If you don't handle the default route, it is sent on to Kestrel. Again it works, but since we're forarding all other static files, the default page is probably a good one to also let IIS handle. You should now have IIS handling most static files, the default empty route and handle HTML 5 routing requests to non API locations. Running ASP.NET Core application under IIS definitely is quite different than running classic ASP.NET applications under IIS. In the old versions everything was self-contained within IIS - in the brave new world of ASP.NET Core there's a lot of extra configuration that has to happen to make things run properly. That's progress for 'ya. All griping aside what I've described here has been pretty common fare for Linux based Web systems for a long time where it's common to use a front end Web server that hooks to a back end application service. The logic behind this is that a service backend should really only deal with its service implementation and not have to support the full gamut of Web service features - that's what a front end Web server like IIS, nginx, Ha-Proxy and the like can provide. I still feel that a lot of what I've shown in this article could have been baked as options into the AspNetCore module because this is clearly the 90% case when running under IIS. If not that then at least the web.config should include some of these IIS Rewrite rules in commented form. But, with the list written down, it's easy to cut and paste now, and you can pick and choose which of these routing features you'd like to use. For most applications I build I think I'll end up using the setup I've described here. Really great stuff Rick. I've been wondering about trying ASP.NET Core on a small new project but been put off by all the confusion. Now I feel happy to give it a go! Are gzip/deflate compressions also offloaded to iis? Or do we need to configure this too? Ryan - compression is handled by IIS for static content, but not for dynamic content generated by Kestrel. The AspNetCore module passed content straight through the pipeline so there's no post processing of requests except for the proxy header fixups (which may actually get added beforehand). Otherwise IIS just forwards the request as is. So, if you want compression in your application generated content you need to use the content compression middleware in ASP.NET Core. How do I have IIS forward custom headers to Kestrel? My application expects some custom headers when running behind a reverse-proxy that it uses for re-writing URLs that it sends back to the client, etc. Do I just use the rewrite module for that? @Joseph - AFAIK IIS should automatically forward all headers and add proxy headers. If not I would consider that a bug. I don't think you can use rewrite for that if you are using the ASPNETCoreModule because it bypasses url rewriting for what it matches. The only way that would work if you completely take the module out of the equation and just forward the calls using IIS Rewrite directly. Rick, thanks for a great series of blog posts. They've really helped me understand more about ASP.Net Core. For caching static content, IIS Admin has its own "Output Caching" setting that lets us define content to cache, either in user or kernel space. Does IIS follow the rules defined there before letting AspNetCoreModule execute its set of rules? IIS will not affect requests that are passed through to the ASP.NET Core module. There's no caching applied there - any caching you do you have to at the Kestrel level. Any settings you apply to IIS will apply only to those things you explictly let IIS handle. Your series of article on the topic of ASP.NET Core and IIS has been invaluable in our efforts to properly set up IIS to run our API. So, thanks for sharing your knowledge and helping to get us going. I'd like to use the wwwroot-static rule to tell IIS to serve the extensionless file, but am not sure how to create the correct match filter, or what path to use to map the StaticFileModule. * seems correct, but of course that maps to the AspNetCoreModule. What might help is the fact the extensionless file ACME needs is placed in the folder path mentioned previously: /.well-known/acme-challenge. Do you have any advice on what the MATCH URL should be for an extensionless file in this path. The file name itself is random. Great article Rick, thanks for sharing. I would have a little question about the static file setup though, I used your code above but it seems to cause problems when trying to reach a sourcemap file. For example, I have my compiled assets under wwwroot/css/ or wwwroot/js/ and they are discovered without problem by IIS but as soon as I'm under dev. environment and try to load sourcemaps, it breaks somewhere and google or any other browser cannot access the files, would you have an idea of how to fix this? Thanks in advance and again, great post! @Os1r1s110 - You probably need to explicitly add a static file handler for .map files as well.However, if you don't then those requests should still end up in Kestrel for processing so they should work - it just won't take advantage of IIS caching and auto-compression. Hi Rick. Not long after my Aug 8 comment, I found one of your posts about LetsEncrypt, so obviously, you are a fan!. Later, I saw your extensive post "Configuring LetsEncrypt for ASP.NET Core and IIS" and that answered my question. I went with the Controller Action with a Custom Route solution. Thank you, thank you, thank you. May your sails be full of just the right amount of wind! I have one domain name for all my sites and all applications are developed in asp.net core (multiple user interface applications and a web api app). for example, https://www.example.com (I'm using an SSL cert). For the end user they just want to use link as below in browser. because of port access restriction. but server automattically identify and rewrite the url and work based on that. for example, If i call this link [https://www.example.com/App1/] it wants to check and rewrite with this link [https://www.example.com:443/]. How do we configure this in IIS & URL Rewriter. I'm doing a project with Node, and this article really helped me to make everything work on nodeiis. I was finally able to make html5 routes of app play nicely with static files and API routes. e.g. http://www.example.com/index.html.bak is also returned, even though it does not exist, because the part which is matched is .../index.html and the .bak is ignored, so IIS will load index.html correctly. If you change your regex to: it will pass the remaining non-space part of the uri to IIS too and in the example above it will return 404. I don't think it's a security issue, as the file actually exists and is readable, but it might prevent file crawlers. The OWASP ZAP toolkit tries to download files with .bak etc. extensions and calls it a Backup File disclosure, but I don't think this applie here. @Tornhoof - good point. It needs the $ at the end to force the final extensions only. And next config does not make sense for me because static compression is not used. What I must do to force IIS works with .json and .svg in the same way like .js and .css ? Thanks for your article, really usefull, my angular App works perfectly with the AspNetCore Api. I would like to exclude swagger from IIS Rewriting. But It didnt work. Do you know how to do that? Could you explain what these updates are supposed to do? @ranouf - the DEBUG key is for remote debugging which shouldn't be redirected. If I recall I had to add that in order for debugging inside of Docker to work. Basically anything you don't want to rewrite has to be explicitly declared and the DEBUG option is one of them. The forwardsWindowsAuthToken is something the project system added (I don't recall adding it). Basically it means that if IIS is authenticated with Windows auth it'll forward the Authtoken in the request data I assume. By default that's not forwarded. I think that's a pretty uncommon scenario, but I suppose it can be requirement in Windows Intranet applications. About be able to access to Swagger-UI, I wrote a post here: https://stackoverflow.com/questions/48889816/iis-rewrite-exclude-folders-and-subfolders-swagger-case/48893301#48893301 Is there other solution you could have think?